It's been some time since we contacted you. Hopefully your 2009 is moving in the right direction for you and as always wishing you the best that can be. Wanted to let our customers in on some great deals we have right now. 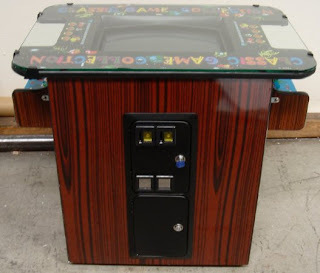 One of our most popular arcade games the MULTICADE with 60 of the all time hottest classic games in one beautiful cabinet is now available in it's original cocktail version. This cocktail version comes in walnut or black cabinet. This game sells for $2995 and we are offering it this week to our customers for only $2195 and FREE SHIPPING ($375 value). These are commercial quality coin operated games. If you want to see list of the 60 games email me We do still have some stand up versions left for $1995. We also are having a great sale on our refurbished arcade games and have tons we need to get rid of and make room for more coming in. Driving games from $1495, Gun Games from $1295, Golden T Golf Games from $1295, Mega Touch Bartop Touchscreen Games from $1295, Pinball Machines from $1895, Slot Machines from $995, Redemption Games from $1395, Pool Tables from $1695, and Much More. Shipping prices have come down a bit with the gas prices so we can probably get you that new game you've been waiting for in a price budget you can afford. Our party season is upon us. If your in the Florida area we are here to supply you all your games for your next event and make it a huge success. Company parties, Graduations, Summer Parties, Corporate Picnics, Bar/Bat Mitzvah, Weddings, Give us a call and see what we can do for you to bring lots of fun to your next event. We are always taking trade in's. So your in the market for a new game for your rec room, don't have the room or the budget? Let us know what you want and what you want to trade for. We will accommodate you the best we can to make a deal.